Michael J. Malatesta was born and raised on Chicago’s Northwest Side. After graduating from Fenwick High School, he attended the University of Iowa where he received a Bachelor of Arts in English. Mr. Malatesta attended DePaul University College of Law where he distinguished himself as a Dean’s List law student. He was honored for his academic achievements by being selected as a research assistant, by Professor John Decker. As a research assistant, he researched and edited sections of Professor Decker’s Illinois Criminal Law, 3rd edition (Lexis Law Publishers, 2000) and drafted articles for Illinois Judicial Conferences. During his first years of law school, Mr. Malatesta also worked full time as a law clerk at the Cook County State’s Attorney’s Office. After leaving the State’s Attorney’s Office, during his final year of school, he worked for one of the most prominent Plaintiff’s law firms in Chicago, beginning his career in civil litigation. 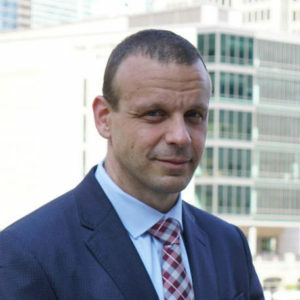 After graduating in the top of his class from DePaul University, Mr. Malatesta practiced civil litigation at two large Chicago law firms before founding his own practice. During his years of practice, he has worked on numerous cases in a variety of practice areas including medical malpractice, products liability, premises liability, dramshop, construction liability, contract litigation, employment law, automobile accidents, §1983 actions and governmental tort immunity cases for municipalities. He has practiced in counties throughout the state of Illinois, states throughout the country and in the Federal Courts. Mr. Malatesta has worked on a number of high-profile cases, including the defense of off-duty Chicago police officer Anthony Abbate in the federal civil suit, Obrycka v. Abbate and City of Chicago. The videotaped incident and subsequent criminal and civil litigation have received international media coverage. Among the other cases receiving media attention include the representation of Plaintiff seeking damages for being secretly recorded by a former boyfriend. He has provided interviews to various news stations and publications. Mr. Malatesta’s diverse background as a litigator includes not guilty verdicts obtained on behalf of defendants and recoveries totaling millions of dollars on behalf of plaintiffs. Mr. Malatesta was named a “Rising Star” by Illinois Super Lawyer Magazine and Chicago Magazine starting in 2009. He represents individuals, corporations and other entities as both Plaintiffs and Defendants. Mr. Malatesta is also a certified arbitrator in Cook County. He is an experienced and accomplished trial attorney. Mr. Malatesta’s clients rely on his commitment to their needs and his skills as a trial attorney. He prides himself on his dedication to his clients and obtaining excellent results for them. A “Rising Star” by Illinois Super Lawyer, and Chicago Magazine 2009, 2010, 2011, 2012, 2013,2014,2015.